During the heat of the summer months, your home's air conditioner needs to be kept in excellent condition so that your home can be kept cool and comfortable and your energy costs as low as possible. It's important to know that you can rely on your AC and that you won't be overpaying on your utilities every month. At our air conditioning company we have a team of professional AC service technicians that are always ready and eager to help you solve any problems that you might encounter with your home's cooling systems. So if you need air conditioning repairs in Topeka or any of our surrounding service areas, don't hesitate to give us a call! Our air conditioning services team is made up of professionally trained and experienced air conditioning contractors, so we can always accurately diagnose and repairs any problems your AC develops. Whether it's running inefficiently or it's started to produce warm air, we'll be able to find the precise cause of the problem and make sure that it's thoroughly repaired. Give us a call today to schedule repairs for your air conditioner, and we'll be looking forward to working with you. The best way to prevent your AC from developing major problems is to have it regularly maintained. Air conditioners that receive proper and regular maintenance will run more efficiently and will need fewer repairs over time. Some of the maintenance that your home's air conditioner needs can be performed without the help of a professional contractor. For instance, you should clean or change your filters regularly during the cooling season, and you might also be able to remove some debris from your duct work at times. These small maintenance tasks can help to improve your air conditioner's efficiency, but our professionals also recommend having an air conditioner tune-up performed at least once each year. When a serious problem occurs with your air conditioner, it's most likely being caused by problems with the compressor or the condenser. The compressor sends cooled air to your ducts where it's distributed throughout your home. If that air flow is restricted by anything, the compressor will not be able to function well, and that will ultimately make your home less comfortable and increase your energy costs. The condenser removes hot air from your home. 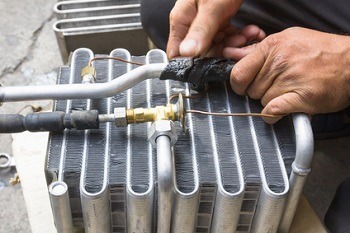 If you place your hand near the condenser, you should be able to feel hot air coming out. If you cannot, you have a problem. If you notice any problems like these, call our Topeka air conditioning repair professionals as soon as possible to have AC repairs performed. If you need air conditioning repairs in the Topeka area, please call Cooper's Inc at 785-267-4100 or complete our online request form. If this is an AC repair emergency, please call us!